Property Size 2,936 sq. 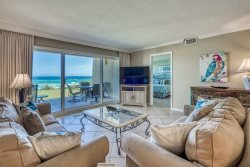 ft.
`Princess of Monaco` is a three-story home located just off the beach and only steps to the beautiful white sand and emerald green waters of Destin. With a community pool, free internet, and designated beach access with no roads to cross, it makes for the ideal family getaway. This house is between Shipwatch and the Crescent condo and is within walking distance of Surf Hut Bar and Grill, Winn Dixie grocery, and The SilverSands Outlet Shopping Mall. You are literally minutes from everything you will need. This home is over 2800 sq. ft. with 5 bedrooms/4 baths. No carpet! The home has upgraded all bedrooms with the new 'Wood-look' tile! The second floor includes a living room with dining area and a full kitchen with a wet bar. Spend time with your family on the balcony off the living room overlooking a tranquil lake. The balcony also has a gas grill and provides glimpses of the gulf. Each floor and every bedroom has its own balcony or deck with which to see beautiful gulf glimpses, spectacular sunrises or breathtaking sunsets. All bedrooms have a TV with the 3rd floor Master and bunkroom having DVD player. The living room and the first floor master also have DVD players. Add $300 for housekeeping and 11% for tax. There is a $69 damage protection fee, $30 booking fee and 2.5% processing fee on credit card payments. A 255 deposit holds the unit for you and is applied toward your rental fee. Saturday to Saturday bookings only.